Woodruff Block, built 1892. 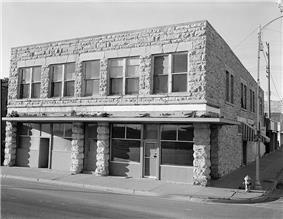 1985 photo, Historic American Buildings Survey. 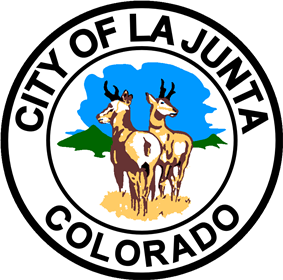 The City of La Junta is a Home Rule Municipality that is the county seat and the most populous city of Otero County, Colorado, United States. The city population was 7,568 at the U.S. Census 2000. La Junta is located on the Arkansas River in southeastern Colorado east of Pueblo. The airport, located 5 miles (8.0 km) north of La Junta, has 77 acres (31 ha) of tarmac and two runways which are still in use. One runway (east-west) is 6,851 feet (2,088 m) long and the other is 5,800 feet (1,800 m). . The 1973 Terrence Malick film Badlands as well as the 1974 film Mr. Majestyk starring Charles Bronson were both filmed in and around La Junta. In 1979, the first episodes of the CBS western miniseries The Chisholms, starring Robert Preston, was filmed near La Junta. 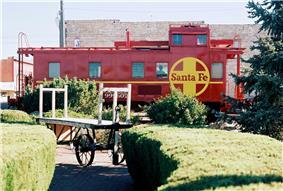 The Caboose (pictured below) is the drive through for the State Bank  which was established in 1893. The bank is unique as it has been remodeled with antiques, including a teller line from the late 1890s. La Junta is located at (37.981333, -103.547540). According to the United States Census Bureau, the city has a total area of 2.8 square miles (7.3 km2), all of it land. The area is high plains terrain, dry with short grass prairie and sagebrush, and is part of the Southwestern Tablelands ecological region. This railroad caboose serves as the drive-up window for The State Bank. There were 7,568 people, 2,977 households, and 1,964 families residing in the city. The population density was 2,652.0 people per square mile (1,025.3/km²). There were 3,277 housing units at an average density of 1,148.3 per square mile (443.9/km²). The racial makeup of the city was 74.22% White, 1.22% African American, 1.77% Native American, 0.86% Asian, 0.13% Pacific Islander, 18.33% from other races, and 3.48% from two or more races. Hispanic or Latino of any race were 43.60% of the population. There were 2,977 households out of which 33.7% had children under the age of 18 living with them, 47.0% were married couples living together, 14.7% had a female householder with no husband present, and 34.0% were non-families. 30.9% of all households were made up of individuals and 15.0% had someone living alone who was 65 years of age or older. The average household size was 2.44 and the average family size was 3.06. In the city the population was spread out with 27.1% under the age of 18, 10.4% from 18 to 24, 24.6% from 25 to 44, 21.4% from 45 to 64, and 16.6% who were 65 years of age or older. The median age was 36 years. For every 100 females there were 89.2 males. For every 100 females age 18 and over, there were 84.1 males. The median income for a household in the city was $29,002, and the median income for a family was $36,398. Males had a median income of $26,325 versus $21,324 for females. The per capita income for the city was $14,928. About 16.8% of families and 21.4% of the population were below the poverty line, including 31.4% of those under age 18 and 10.0% of those age 65 or over. Bent's Old Fort National Historic Site, an important trading post along the Santa Fe Trail, is northeast of La Junta. Koshare Indian Museum, housed at Otero Junior College, holds a collection of Native American artifacts. The Koshare Indian museum hosts a unique Boy Scout/Explorer program which trains the Scouts in both Indian dance and costumes. The Scouts give dance performances during the summer and also host many other Scout troops passing through the area. Purgatoire River track site, one of the largest dinosaur track sites in North America, is south of La Junta. Picketwire Center for Performing Arts, home of the local theater company. City Council: Eugene Mestas, Betty Velasquez, Jeffri Pruyn, Bob Friedenberger, Roger Roath, Frank McKenzie. The city is served by a daily newspaper, The Tribune-Democrat. La Junta once had a major (ex-Santa Fe) railroad yard for assembling freight trains for the climb over Raton Pass, but those days are over. Successor BNSF runs freight trains between Denver and Kansas/Texas via La Junta. The sole remaining major train crossing Raton Pass today is the daily AMTRAK "Southwest Chief", in both directions, between Los Angeles and Chicago. U.S. Highway 50 travels through La Junta, approaching from Pueblo to the northwest and continuing eastward towards Lamar and into Kansas. U.S. Highway 350 begins at La Junta and travels southwest before reaching Trinidad. State Highway 10 also begins at La Junta and travels west-southwest before reaching Walsenburg. Wendell Fertig, World War II hero who led the guerrilla resistance against the Japanese on the Philippine island of Mindanao. Felix Tippy Martinez, major league pitcher born in La Junta. Set a major league record by picking off three base runners in one inning. Colorado political leader Dan Slater was born in La Junta. Downtown La Junta with the post office on back right. La Junta's newspaper is the Tribune-Democrat.